This simple and tasty recipe is low in fat and brimming with goodness. Salmon is an excellent source of high-quality protein, vitamins and minerals. An oily fish, containing omega-3 fatty acids, salmon contributes to healthy brain function, heart, joints and general wellbeing. It is advisable to introduce oily fish to your diet 3 times a week. Aubergine, or eggplant, has a wealth of health benefits. It is bursting with vitamins and minerals and is low in fat yet rich in fibre, helping to lower cholesterol and manage weight. The skin of the aubergine is rich in antioxidants with potential health effects against cancer, aging, inflammation, and neurological diseases. 1. Heat oven to 200°C, fan 180°C, gas 6. 2. Mix the miso, chilli, lemon, honey and garlic together, coat the salmon and leave to marinate. 3. With a sharp knife, score the flesh of the aubergine diagonally both ways, brush with oil, season and place on a baking tray. 4. Bake the aubergine for 20-25 minutes depending on the size, covered in foil. 5. Remove the foil and add the salmon to the baking tray. 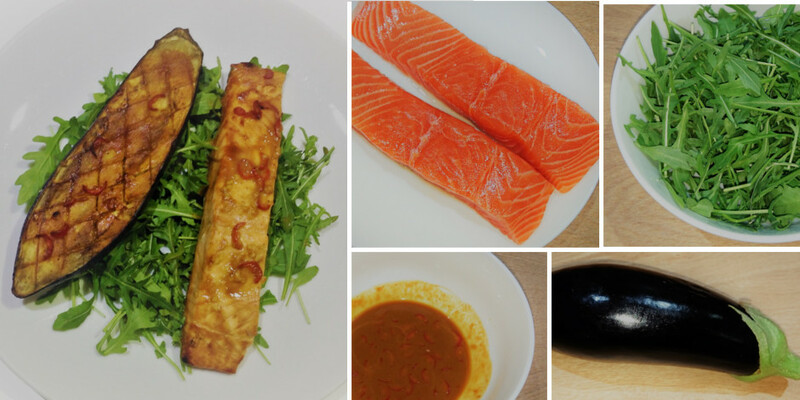 Brush both the salmon and aubergine with the miso mixture and cook for 5 minutes. 6. Sprinkle the sesame seeds over the aubergine and salmon and cook for a further 5 – 7 minutes until the salmon is cooked through and the aubergine is tender. 7. Serve on a bed of rocket and drizzle the remaining juices on top.